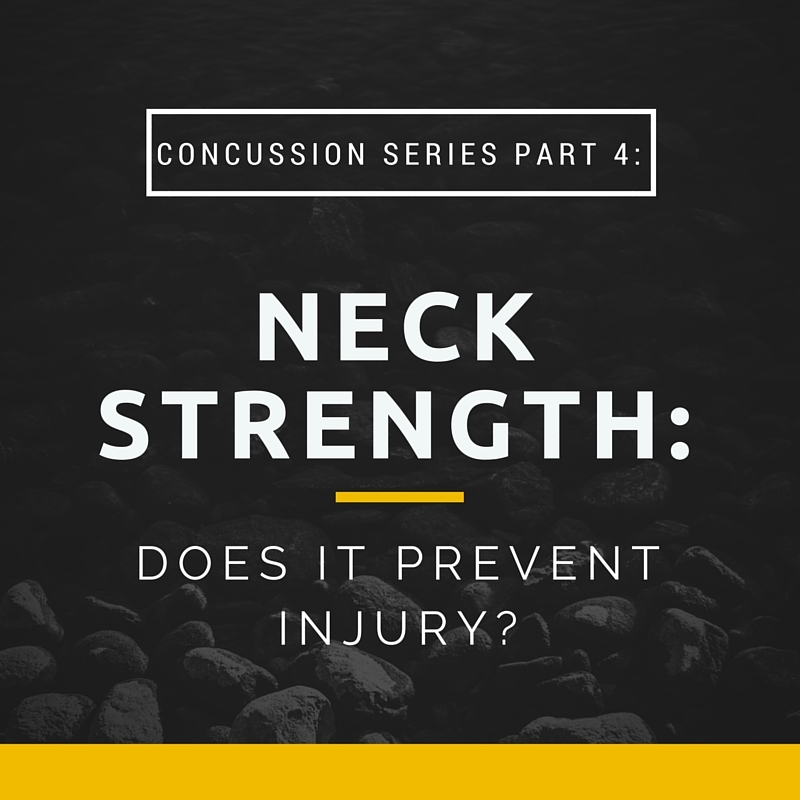 Blog Concussion Series Part 4: Does Neck Strengthening Prevent Injury? Do these programs work? I’ll examine the research below. Strengthening the neck muscles may help to decrease acceleration of the head- the muscles act like “shock absorbers,” decreasing kinetic energy during impact of the head (think of the padding in a football helmet- it does the same thing around the skull). – There is an inverse relationship between neck strength and head acceleration with heading- athletes with weaker necks had greater impact forces. – Using these muscles to “brace for impact” reduces the amount of head acceleration during heading. – Females typically exhibit weaker neck musculature than males- likely one reason why concussions are more common in females (more info on concussions in females here). The biggest evidence for neck strengthening came in 2014 with this study, showing that every 1lb increase in neck strength decreases odds of a concussion by 5%. The authors of the study concluded that screening for neck strength could be a powerful tool in determining athletes at increased risk for concussion and targeting them for injury prevention programs. However, not all research supports neck strengthening in prevention of concussions. Athletes who performed resisted neck flexion and extension exercises twice per week showed improved neck muscle thickness, or girth, but no improvement in the stability of the head or neck. This is one reason why Sports Medicine Experts question Syracuse’s program, which emphasized improvements in neck circumference. Researches have been unable to find a correlation between neck thickness and concussion rate. Some people with taller, slender necks have been found to have greater neck strength.